How can you know if your Mercedes has one of these first generation auto climate controls? If the control panel looks like the one in the picture then welcome to the club! These systems were installed in the US models 1977 to 1980 W107, W116 and the early W123 chassis. What can you do if you have one of these and it is not working properly? The first thing you will need is an overview of the key components of the system, where they are located, and options for replacement. Then you will need to learn how to troubleshoot the system to find out what exactly is causing your heat or no heat problems. Once you know the culprit you will need to understand the options to either restore the system to original or install a manual system over ride. Check our current list of related products to see what resources we offer for you at this time. See Kent's on demand video for an introduction to this early system. Part 1 will cover location and function of the key components and Part 2 will cover troubleshooting and repairing the system ( Part 2 available early April 2014). The most common failure part is the large climate control servo. 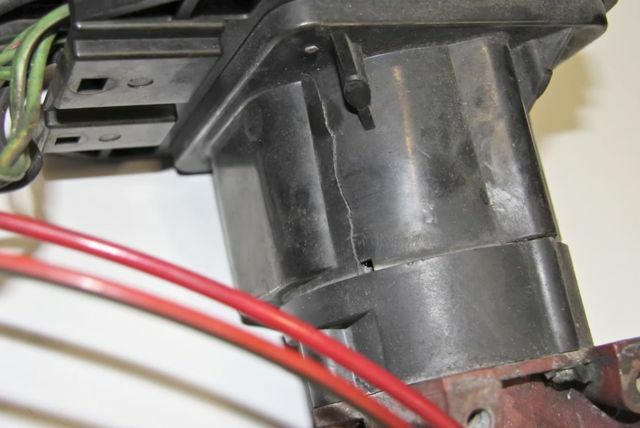 The plastic housing cracks allowing coolant to get inside to the electrical and mechanical components causing the servo to seize open or closed. In this picture you can clearly see the crack in the housing. The system relies heavily on vaccum so you want to make sure there are no leaks in your vacuum system and on diesel models make certain the vacuum pump is producing the proper vaccum. If the blower is not running, it could be related to a vacuum leak or an electrical problem. It could also just be worn brushes in the motor itself. We have motor brush replacement kits with instructions on how to install them yourself. If the battery is draining all the time that could indicate a seized servo.